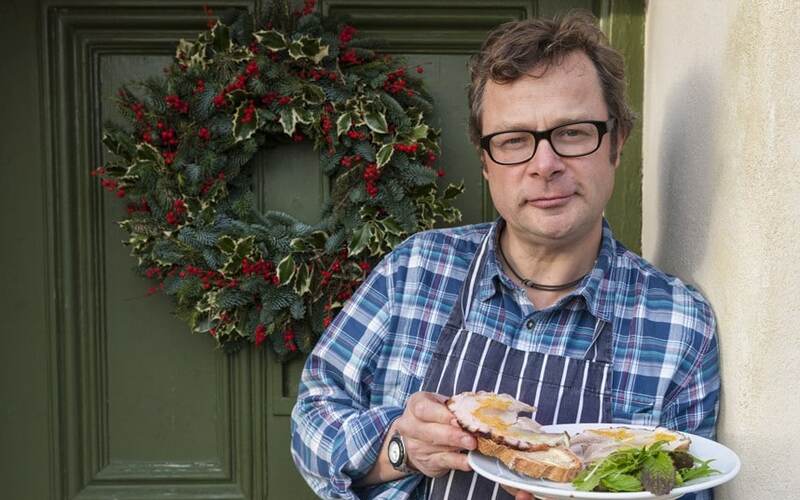 Holiday Season Countdown – a turkey stuffing recipe from celebrity chef Hugh Fearnley-Whittingstall, featuring tons of celery. Hugh is an English celebrity chef, journalist, television personality, and food writer, known for his “back to basics” philosophy. In this recipe, he combines celery, prunes, and other more-ish ingredients for a truly indulgent turkey stuffing. Make little slits in the chestnuts then blanch or roast them to ease peeling. Simmer the chestnuts in unsalted water until completely tender (15-20 minutes). Drain and leave to cool, then place in a basin and roughly break them up with a fork - you want them crumbled rather than puéed. Sweat the onion and celery in the butter over a medium heat for a few minutes until softened, then add the prunes, chestnuts and parsley. Season with salt and pepper, mix well and cook for a further few minutes. Remove the pan from the heat. Serve slices of the stuffing with the turkey. “A turkey,” he says, “will give you this spectacular moment when the bird is brought to the table. But from then on it’s frustration and tears for the cook. The problem is that the legs and breast cook at different speeds, particularly when you’re using free range. These birds have been around for months, and those legs have been heaving this fairly hefty weight around, so they’re strong, tough muscles that cook more slowly than the breast. “This gives you a dilemma. On the one hand, you could cook the bird through so the legs are properly done, and risk drying out the breast. On the other, you could keep the breast moist and end up with legs that are still very tough and a bit bloody on the inside. “So if I’m going to cook a turkey I’m going to take the legs and wings off and cook them separately. I know that sounds a bit cheffy, and I know people like to bring a whole, intact bird to the table. But it absolutely transforms the way you eat this bird. “I’ll joint the legs and cook them using a fairly classic coq au vin recipe. This is good dark meat, so slow-cooking works really well. Then I will quickly roast the body of the bird, open cavity, and rest it; this will give me a nice moist breast, none of that dry, stringy turkey. Then I’ll slice the breast, and serve it off the bone. “Best of all, you end up with this fantastic liquor from your coq au vin, or your turkey legs au vin. I’ll put a bit of pork belly or pancetta in there to build up the flavour of the juice, along with some onions, carrots, and celery. This will produce as good a gravy as you’re ever going to get for your turkey, all from the liquor of this lovely stew. You end up with a little ladle of dark meat with a lovely rich juice to pour over the breast. It isn’t hard at all. The only thing you’re going to miss out on is that spectacular, huge bird coming to the table.